Tattoos are not just fashionable to sport but a medium of expressing one’s individuality and personality too. Tattoos can be of various types like cartoon tattoos, phrases, names, artistic work, celebrity faces, spiritual, religious and any abstract thing as well. If they are adorned with confidence and the right attitude, then it can alter your appearance and even transform a previously known nerd into a hot hunk or diva. They can look cooler and more appealing to some than jewelry or other accessories. Latest in rage is the heart locket tattoo which looks super cool and stylish. You can have the name or initials or any other symbol of your loved one in it to make it memorable and of emotional value to you. You can have your own innovative and customized heart and locket shaped art work inked on your body or take the advice or reference from experts. It can portray many different meanings and can be of very personal and emotional value to some. Since it is a permanent thing one should be very cautious and confident before deciding to go for it, and you never know, it could turn out to be the best decision you took to improve your personality or proclaim your love for someone special to the world. This beautiful romantic tattoo represents true love for someone special holding the key to unlock the heart. It can mean different things to different people, flaunt it if you are a true romantic at heart. Beauty really lies in simplicity, flaunt this cute and simple tattoo of love. Adorn this gorgeous diamond and heart tattoo on your foot and get all the attention! Get the names of your loved ones inked on your body forever and proclaim your love in style through this beautiful tattoo. This sweet colored tattoo on the arm may be a symbol of true love for the person who has the key which fits the keyhole at the centre of the locket. This royal looking unique tattoo can portray different meanings to different people. It could mean two opposite kind of people or qualities can unlock the heart of this individual. 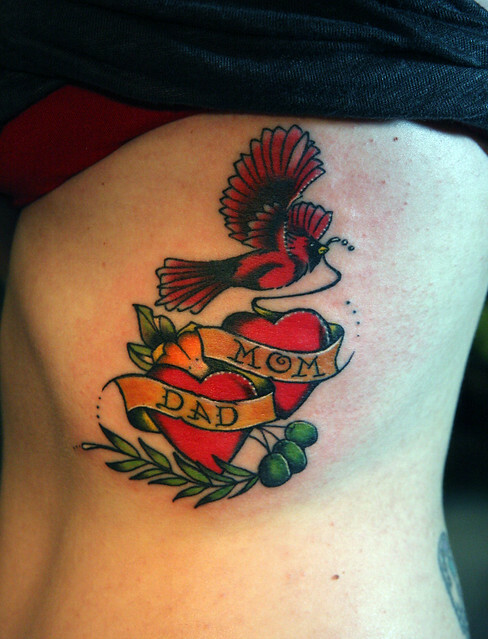 Proclaim your love for your parents with this beautiful pair of hearts and the bird, and make them truly happy. This rare black tattoo with the heart in the centre and a key to unlock all its mysteries is quite spectacular. This locket shaped heart with the bird carrying the key is so beautifully done and an intricate piece of art work. This dark red heart denotes love and passion which belongs to just one person the true beloved of the person. Get this royal looking black heart shaped tattoo on your belly and flaunt it in style. Show the world how happy you are and that love is truly in the air through this cute heart shaped tattoo with wings. Get this look if you believe in simplicity and that true love is the love of God and in having supreme faith in the Almighty. Get this unique and intricate piece of work and flaunt it with pride and the right attitude. Show your love and passion for your soul mate through this unique and adorable tattoo on your body. Get the names of the people who matter most to you and are closest to your heart on your chest with this elaborate and intricate piece of work. Get this super stylish work with the initials of your loved one inked at the centre of the heart shaped tattoo and proclaim your love to the world. You do not need to buy an expensive locket to look gorgeous and to show your love, get this tattooed and look gorgeous. Sport this unique tattoo with both the good and the dark evil side by side. The classic and royal heart and key shaped tattoo with a dash of color makes this one a keeper. Intelligently done with the key through the heart, this tattoo looks different and charming. Get this beautiful flowery tattoo if your soul is set on someone special who holds the key to your heart. This amazing looking heart tattoo with a colorful chain around it will surely grab all the right attention! Get this symbol of pure love and passion in the shape of a locket and a rose on top with beautifully placed key to unlock the heart in the centre. Get this royal and classic tattoo if you believe in proclaiming your love in a grand way! Apt for those who are bold and daring and want to go for a different look. The serpent and the arrow through the heart shows the dark and dangerous side of passionate love.